Still on the subject of red, I’d just like to publicly thank my German friend Rosi for bringing me back a little gift from Germany. Back in the late 1990s (I think), Wrigleys brought out some chewing gum to the shores of Blightly, known simply as “Big Red”. Regular viewers to my blog will remember my trip to Berlin in 2007. I rediscovered this particular confectionery on a shelf in a branch of Woolworth in Spandau. Unfortunately, this epic discovery only managed to accumulate 2 lines in the blog. It really should have gained more. 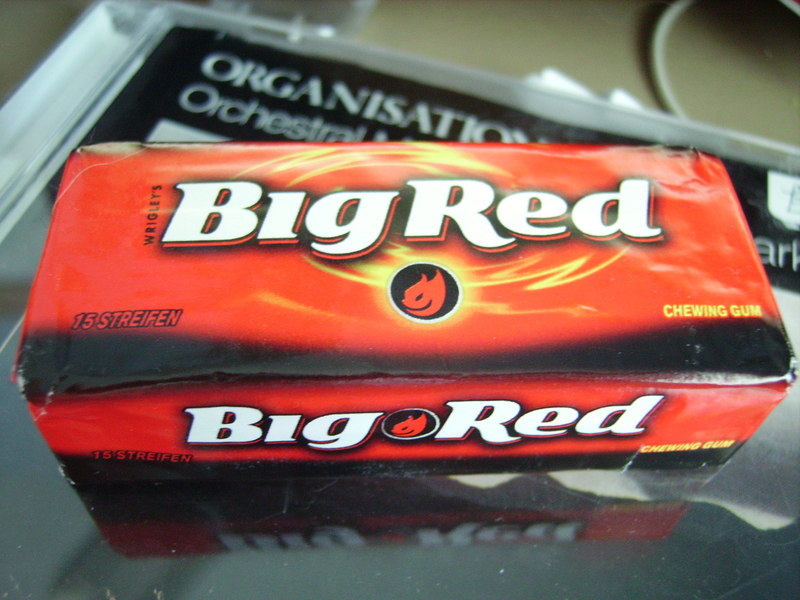 “Big Red” was a cinnamon flavoured gum, and I thought it was truly epic. Clearly, nobody else did, and after being around for only a short preiod of time, the product was withdrawn, and it was forgotten about by everyone in the country, except me. A quick thing I will mention is that if anyone either goes to Germany, or the US/CANADA, you MUST bring me back at least 5 packs of Big Red chewing gum back. It’s awesome. I never made the connection between a friend / work “colleague” (I hate that word) going on regular visits to her family in Germany, and my ability to acquire the afore mentioned tasty mastication device until very recently, say the end of last year. Rosi mentioned she was returning home for the holiday season (another phrase I hate! It’s Christmas!). Something clicked in my head. Maybe I was chewing some bland, mint flavoured UK gum. either, I asked her to bring me some “Big Red” back. I think she thought I was mad. Unfortunately, she didn’t remember my request, but I was still hopeful that in a future trip I could convince her my love for this product was genuine. Several weeks ago, she mentioned that she was going back to Germany…. every five minutes! This allowed me to build up a catchphrase of “Don’t forget my Big Red!” I was hopeful that she would remember. There were 2 sealed packets containing 15 sticks, and one that had been broken into, but I could hardly complain. The sealed packets contained 15 sticks, and there were only 4 removed from the open one. I gave a couple of more sticks away to the people who were curious what the fuss was all about (they also agreed that it was awesome), which still left me with about 36 sticks of the stuff. Considering my wish was for someone to bring me 5 packets back, which I based on a 7 stick pack, 7×5+whatever was left = 35+. I was, and still am delighted. I’ve not seen Rosi to thank her yet, but I sent her a text as soon as I recieved my collection. Unfortunately, I know that she doesn’t read this site, making the previous 539 words completely pointless,but if you approach me, and my breath smells of curry, rotting teeth and cinnamon, you now know why. True fact: “Big Red” chewing gum isn’t actually red.